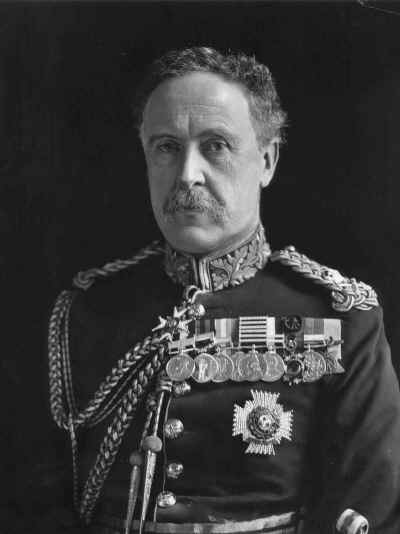 Biog: Captain The Rifle Brigade, 1884; Colonel Commanding 7th Battalion The Rifle Brigade, 1911; A.D.C. on the staff of Lord Roberts; A.D.C to the King. Costume: Peer's Robes over Full Dress uniform, Captain, The Rifle Brigade (The Prince Consort's Own). Furniture & Props: Painted backdrop; chair. Biog: Burke's Peerage; The Complete Peerage; Who's Who; The Army List, 1902; The Times, 1 May 1924, p. 18d. Occasion: (The Coronation: The King's Procession) The Times, 11 August 1902, p. 5d. Costume: (Peer's Robes) H. Graham Bennet, ed, Dress Worn by Gentlemen at His Majesty's Court and on Occasions of Ceremony, London, 1903; (uniform) Dress Regulations for the Army, London, 1900.